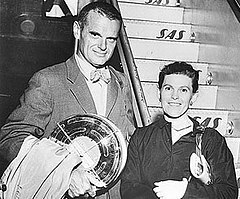 Charles Ormond Eames, Jr. /ˈiːmz/ (1907–1978) and Bernice Alexandra "Ray" Kaiser Eames (1912–1988) were an American design married couple who made significant historical contributions to the development of modern architecture and furniture through the work of The Eames Office. Among their most well-known designs is the Eames Lounge Chair. They also worked in the fields of industrial and graphic design, fine art, and film. Charles was the mouthpiece and public face of the Eames Office but Ray and Charles worked together as creative partners and employed a diverse creative staff. Honorary Doctorate, Otis College of Art and Design, 1984. 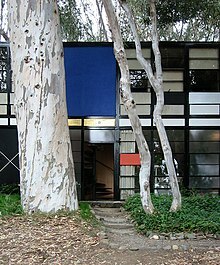 The design office of Charles and Ray Eames functioned for more than four decades (1943–1988) in the former Bay Cities Garage at 901 Washington Boulevard in Venice, Los Angeles, California. The Eames' were bolstered by the royalties from Herman Miller for their early furniture designs which enabled them to establish the Eames Office. They worked 13-hour days and directed the work of a team of collaborators. Through the years, its staff included many notable designers: Henry Beer and Richard Foy, now co-chairmen of CommArts, Inc.; Don Albinson; Deborah Sussman; Annette Del Zoppo; Peter Jon Pearce; Harry Bertoia; and Gregory Ain, who was Chief Engineer for the Eameses during World War II. The Eames Office was a diversified workplace that employed local people, war veterans, and housewives. The Eameses also believed in "learning by doing"- before introducing a new idea at the Eames Office, Charles and Ray explored needs and constraints of the idea extensively. In 1943 Ray and Charles developed a leg splint. This was in response to medical officers serving in World War II combat zones reporting the need for emergency transport splints. The Eameses created their splints from wood veneers, which they bonded together with a resin glue and shaped into compound curves using a process involving heat and pressure. Using the material they had for the furniture in the guest bedroom of their apartment. With the introduction of plywood splints, they were able to replace problematic metal traction splints that had side effects of inducing gangrene due to impairment of blood circulation. In the late 1940s, as part of the Arts & Architecture magazine's "Case Study" program, the Eameses designed and built the groundbreaking Eames House, Case Study House #8, as their home. Located upon a cliff overlooking the Pacific Ocean and hand-constructed within a matter of days entirely of pre-fabricated steel parts intended for industrial construction, it remains a milestone of modern architecture. Eames products were also manufactured on Washington Boulevard until the 1950s. 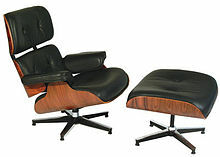 Among the many important designs originating there are the molded-plywood DCW (Dining Chair Wood) and DCM (Dining Chair Metal with a plywood seat) (1945); Eames Lounge Chair (1956); the Aluminum Group furniture (1958); the Eames Chaise (1968), designed for Charles's friend, film director Billy Wilder; the playful Do-Nothing Machine (1957), an early solar energy experiment; and a number of toys. In the 1950s, the Eames Office continued their work in architecture and modern furniture design. As with their earlier molded plywood work, the Eameses pioneered technologies, such as fiberglass furniture, plastic resin chairs, and the wire mesh chairs designed for Herman Miller. From the beginning, the Eames furniture has usually been listed as by Charles Eames. In the 1948 and 1952 Herman Miller bound catalogs, only Charles' name is listed, but it has become clear that Ray was deeply involved and was an equal partner with her husband in many projects. In August 2005 Maharam fabrics reissued Eames designed fabrics; Sea Things (1947) pattern and Dot Pattern. Dot Pattern was conceived for The Museum of Modern Art’s “Competition for Printed Fabrics” in 1947. The Eames fabrics were mostly designed by Ray, as were the Time-Life Stools. In 1979, the Royal Institute of British Architects awarded Charles and Ray with the Royal Gold Medal. At the time of Charles' death they were working on what became their last production, the Eames Sofa, which went into production in 1984. Charles and Ray channeled Charles' interest in photography into the production of 125 short films. From their first film, the unfinished Traveling Boy (1950), to Powers of Ten (re-released in 1977), to their last film in 1982, their cinematic work was an outlet for ideas, a vehicle for experimentation and education. The couple often produced short films in order to document their interests, such as collecting toys and cultural artifacts on their travels. The films also record the process of hanging their exhibits or producing classic furniture designs. Some of their other films cover more intellectual topics. For example, one film covers the purposely mundane topic of filming soap suds moving over the pavement of a parking lot. Powers of Ten (narrated by physicist Philip Morrison), gives a dramatic demonstration of orders of magnitude by visually zooming away from the earth to the edge of the universe, and then microscopically zooming into the nucleus of a carbon atom. The Eameses also conceived and designed a number of exhibitions. The first of these, Mathematica: A World of Numbers... and Beyond (1961), was sponsored by IBM, and is the only one of their exhibitions still extant. The Mathematica exhibition is still considered a model for science popularization exhibitions. It was followed by A Computer Perspective: Background to the Computer Age (1971) and The World of Franklin and Jefferson (1975–1977), among others. Kleinhans Music Hall Chair (1939–40) Charles Eames, Eero Saarinen, Eliel Saarinen. Conversation Armchair (1940) Charles Eames & Eero Saarinen. Side Chair (1940) Charles Eames & Eero Saarinen. Molded Plywood Pilot's Seat (1943) Charles & Ray Eames and staff. Prototype Plywood and Metal Chairs (various models) (1943-1946) Charles & Ray Eames and staff. Molded Plywood Elephant (1945) Charles & Ray Eames and staff. Lounge Chair Wood or LCW (1945-1946) Charles & Ray Eames and staff. Lounge Chair Metal or LCM (1945-1946) Charles & Ray Eames and staff. Dining Chair Wood or DCW (1945-1946) Charles & Ray Eames and staff. Dining Chair Metal or DCM (1945-1946) Charles & Ray Eames and staff. Molded Plywood Folding Screen (1945-1946) Charles & Ray Eames and staff. Molded Plywood Coffee Table wood or metal legs (1945-1946) Charles & Ray Eames and staff. "Donstrosity" prototype lounge (1946) Charles & Ray Eames and staff. Prototype Plywood Lounge with metal base (1946) Charles & Ray Eames and staff. Prototype Stamped Metal Chairs (1948) Charles & Ray Eames and staff. LaChaise prototype (1948) Charles & Ray Eames and staff. Molded Plastic & Fiberglass Armchair Shell various bases (1948-1950) Charles & Ray Eames and staff. Wire Mesh Side Chair or DKR (1951) Charles & Ray Eames and staff. Hang-It-All (1953) Charles & Ray Eames and staff. 670 & 671 or Eames Lounge & Ottoman (1956) Charles & Ray Eames and staff. Leisure Group (later Aluminum Group): High Back Lounge, Low Back Lounge, Dining Side Chair (1958) Charles & Ray Eames and staff. Eames Chaise (1968) Charles & Ray Eames and staff. The World of Franklin and Jefferson (1975) built for the US Bicentennial Commission, opened in Paris, traveled to five other countries and the US. House Of Cards, a card construction game. On June 17, 2008, the US Postal Service released the Eames postage stamps, a pane of 16 stamps celebrating the designs of Charles and Ray Eames. A documentary about the couple titled Eames: The Architect and the Painter was released on November 18, 2011 as part of the American Masters series on PBS television and on YouTube from PBS as Cd1 and Cd2. The World of Charles and Ray Eames Barbican Art Gallery, October 21, 2015 – February 14, 2016. Eames & Hollywood, Art & Design Atomium Museum, March 10, 2016 – September 4, 2016. ^ "California Dreaming: Reconsidering the work of Charles and Ray Eames". Apollo Magazine. 2015-10-15. Retrieved 2019-01-26. ^ a b Roger Vincent (July 15, 2012), Former Eames furniture design headquarters sold in Venice Archived 18 July 2012 at the Wayback Machine Los Angeles Times. ^ a b January, 1; Slessor, 2015By Catherine. "Charles Eames (1907–1978) and Ray Eames (1912–1988)". Architectural Review. Retrieved 2019-01-30. ^ Neuhart, Marilyn Neuhart, with John (2010). The story of Eames Furniture. Berlin: Gestalten. pp. 200–207. ISBN 9783899552300. ^ Denzer, Anthony (2008). Gregory Ain: The Modern Home as Social Commentary. Rizzoli Publications. ISBN 0-8478-3062-4. Archived from the original on 2008-06-17. Retrieved 2008-08-31. ^ a b "Leg Splint | Eames Office". Eames Office. 17 February 2014. Retrieved 21 June 2018. ^ Home&f=false A Designer's Home of His Own Archived 8 November 2015 at the Wayback Machine LIFE magazine. 11 September 1950. page 148. ^ "Maharam Sheers by Eames". Maharam. Archived from the original on 23 June 2015. Retrieved 22 June 2015. ^ "Sea Things by Charles and Ray Eames, 1947". Maharam. Archived from the original on 1 July 2015. Retrieved 22 June 2015. ^ "The Films of Charles and Ray Eames: Box Set". Archived from the original on 22 June 2015. Retrieved 22 June 2015. Between 1950 and 1982, Charles and Ray Eames made over 125 short films ranging from 1-30 minutes in length...This 6-disc DVD set contains 39 films by the husband and wife team, including Powers of Ten, House: After 5 Years of Living, Design Q&A, Tops, Eames Lounge Chair, Day of the Dead, Toccata for Toy Trains and The World of Franklin and Jefferson. ^ The original was created for a new wing of the (currently named) California Science Center; it is now owned by and on display at the New York Hall of Science. In late 1961, a duplicate was created for the Museum of Science and Industry in Chicago, Illinois; in 1980 it moved permanently to the Museum of Science in Boston, Massachusetts. A third copy was created for the 1964/1965 New York World's Fair IBM exhibit. After the World's Fair closed, it was moved to the Pacific Science Center in Seattle, Washington where it stayed until 1980. It was then moved to SciTrek in Atlanta, Georgia, but the organization was shut down in 2004 due to funding cuts. As of 2014, the status of this last copy is unclear, but individual pieces may have been dispersed for exhibition separately. ^ Eames, Charles; Ray Eames. "A Communications Primer (PA9049)". Prelinger Archives (archive.org). Retrieved 22 June 2015. ^ Eames, Charles; Ray Eames. "The Information Machine (Sponsor: IBM)". Prelinger Archives (archive.org). Retrieved 22 June 2015. ^ Eames, Charles; Ray Eames. "The Image of the city (sponsorship of Westinghouse Electric Corp)". Encyclopædia Britannica Educational Corporation (archive.org). Retrieved 22 June 2015. ^ Eames, Charles and Ray (2015). Ostroff, Daniel (ed.). An Eames Anthology: Articles, Film Scripts, Interviews, Letters, Notes, Speeches by Charles and Ray Eames. New Haven and London: Yale University Press. pp. 276–279. ISBN 978-0-300-20345-5. ^ American Masters (20 June 2015). "Charles and Ray Eames: The Architect And The Painter Cd1". PBS. YouTube. Archived from the original on 7 December 2015. Retrieved 22 June 2015. ^ American Masters (20 June 2015). "Charles and Ray Eames: The Architect And The Painter Cd2". PBS. YouTube. Archived from the original on 28 November 2015. Retrieved 22 June 2015. ^ Review: Charles and Ray Eames at Design Museum Archived 29 April 2010 at the Wayback Machine, World Sculpture News, 4,4 (1998). Butler, Cornelia and Alexandra Schwartz eds. Modern Women: Women Artists at the Museum of Modern Art, 220-224. New York : Museum of Modern Art, 2010. Prouvé, Jean. Charles & Ray Eames. Die großen Konstrukteure – Parallelen und Unterschiede. Vitra Design Museum, Weil am Rhein 2002. (ISBN 3-931936-37-6) (de., frz., engl.). Ostroff, Daniel, ed. (2015). An Eames Anthology: Articles, Film Scripts, Interviews, Letters, Notes, Speeches by Charles and Ray Eames. New Haven: Yale University Press. ISBN 978-0-300-20345-5. 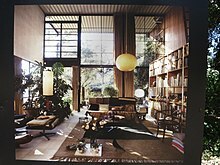 Wikimedia Commons has media related to Charles and Ray Eames.